The final card for our March Stamp Camp lets you choose your own flowers: shamrocks or garden flowers. The cards follow the same style, but you add your own stems and any number of flowers. 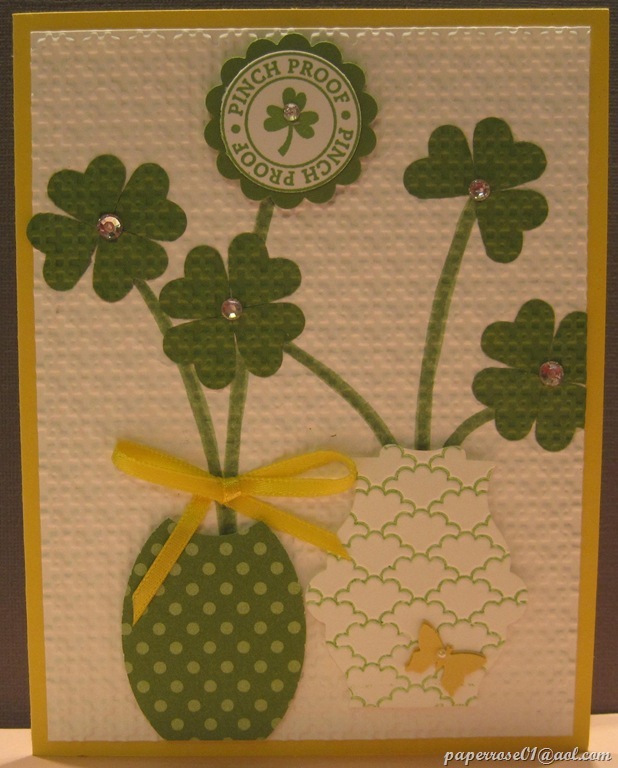 Pinch Proof is a great card for celebrating St. Patrick’s Day. This card uses the retired Pinch Proof stamp set and features shamrock flowers made from small Gumball Green punched hearts! Aren’t they cute? We start by drawing stems that will end in one of two vases. Then we adhere the small punched hearts – I used 15 for this card. Finally, we run the Whisper White cs thru the Big Shot with the Square Lattice embossing folder. This gives the flowers a pressed look. The vases are then added with Stampin’ Dimensionals along with a bit of yellow ribbon and a So Saffron Butterfly with a tiny pearl. Rhinestones are added for a bit of glitz, and the Pinch Proof message appears as a flower. But perhaps you need a card for another occasion – birthday, get well, thinking of you, etc. This For You card follows the same style as Pinch Proof but we add Petite Petal flowers. There are 6 different flowers you can stamp and all are the same size. The Petite Petals punch quickly punches your flowers which you adhere along your stems. 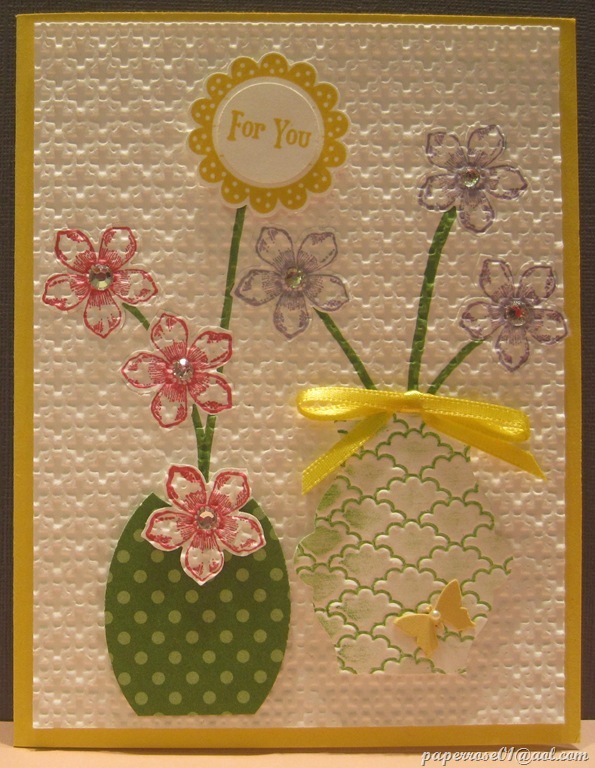 After embossing your card stock with the Square Lattice folder, you add your vases, ribbon, and butterfly. Instead of the Pinch Proof “flower”, you will make a For You “flower” stamped in Crushed Curry. Although I used Melon Mambo and Elegant Eggplant flowers here, you can use any color ink and add as many flowers as you wish. The vases and butterflies have been punched. Quite a few small hearts have also been punched as well as some flowers. However, you can stamp and punch your own if you wish. This is YOUR card! Dates and times for our March Stamp Camp are: Thursday, March 13 from 2 – 9 PM; Friday, March 14 from 2 – 9 PM; and Saturday March 15 from 9 AM to 4 PM. Cost is $12 and includes all materials and supplies. I hope you can come and enjoy these spring creations. Before long, flowers will be poking their little heads thru our soon-to-thaw soil. Spring cannot come too soon for me! I have had it with winter – especially after experiencing the warm weather and sunny days on our cruise! Our stamp camps are back on schedule – the first consecutive Thursday, Friday, and Saturday of each month. April Stamp Camp will be the 3rd, 4th and 5th of April so we will have plenty of time. Give me a call or E-mail if you have any questions.